Alex Creel is the owner of the highly regarded Golden Spikes Baseball Club and K3 Pitching in Sacramento, CA. He has been a “ranch guy” and a good friend for many years. Alex was among the attendees at the 2015 Texas Baseball Ultimate Pitching Coaches Boot Camp when Frans Bosch rocked the US baseball community with an epic presentation on skill acquisition and motor learning. The impact on Alex’s business has been significant and measurable — significant in its impact on his players’ success and measurable in the added revenue produced for his business. I asked Alex to write us a note explaining why he cannot imagine missing The Florida Baseball Ranch®/Dutch Baseball Skill Acquisition Summit on Sep 8-9. “Since hearing Frans Bosch in 2015 at the Texas Baseball Ranch’s Ultimate Pitching Coaches Bootcamp, I have come to understand that my old style of verbal cue coaching is outdated and hindering the development of my players. Although the presentation was difficult to understand, I did walk away with one key piece, and that was the body could care less what the coach says. Since that talk, we have been trying to implement his teachings on skill acquisition. Even though we don’t understand all the details of the dynamic systems theory, what we have used has led to incredible gains by our students. Watching guys like Owen Cuffe go from low 70s and pain to 90+ and a candidate for a D1 scholarship has been one of coaching’s greatest joys. As far as a business investment, the application of DST principles has set us apart from the mainstream and the results that we have been able to produce have led to an exponential increase in our revenue. We have been able to reinvest in our business and that has helped our students achieve their dreams while saving their families thousands in tuition costs, just ask Nate Hansen (Oregon State) and Ryan Harvey (UC Santa Barbara) how. I am jumping at the opportunity to go to the Florida Baseball Ranch’s Summit Sept. 8-9. I know that I have gotten incredible information out of hearing Bosch, Nijhoff, Sullivan, and Wolforth speak, and I am eager to dive back in to hear the others going and become a better coach. Each year I hear one of the above speak on DST Application, they continue to find ways to put it into Lehman’s terms so that people like me can continue to understand the concept better. I can’t wait to see what the presenters have put together for this go round. There are so many questions that I have about foot plant from above, co-contraction, creating a better learning environment and how to become a better programmer for my guys that I know will be answered and help me become a better version of myself as a coach. 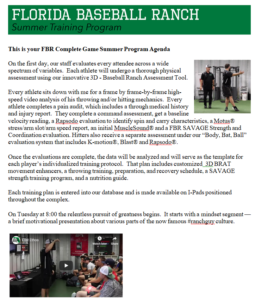 The Early Bird Discount for registration for the FBR/Dutch Baseball Skill Acquisition Summit expires at 11:59 pm on July 18th.